I always perk up when someone says they have old photos from San Francisco that need location identification. Sometimes I’m lucky and know the site; other times there is too little to go on. A grouping of contemporary photos, like in an album, adds more clues to find locations. I recently was presented with a series of photos in two albums that became one of the more challenging and fun projects I have attempted. This is a detective story of sleuthing collaboration, combining old research skills and new digital technology mixed with a good dose of luck. In late October 2011, Craig Bryan in Northridge, California, contacted the San Francisco Museum and Historical Society by email, hoping to find help figuring out the background and maybe the creator of two albums he found a couple of years ago in a corner of a prop-shop liquidation sale in Los Angeles. The secretary of the Society forwarded the email with its four photos to me to see if I wanted to get involved. 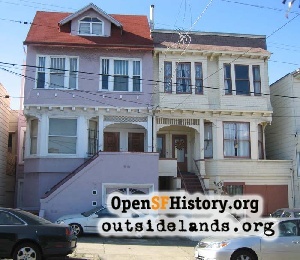 The photos showed two identical houses, a street view taken from the porch of one of the houses, a burned-out brick building suggesting the 1906 fire, and a cable car passing along a street. Not much to go on, but I bit and contacted Craig to see what else he had that led him to think the albums originated in San Francisco. Craig sent me four other scans at higher resolution and another variation of the street seen from a front porch. 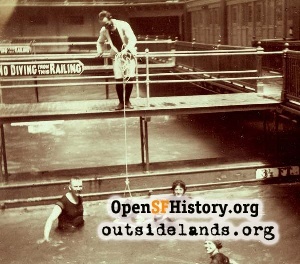 I immediately recognized a beach scene below the ornate 1896 Cliff House and a view that sure looked like a family swimming outing inside Sutro Baths, so there was no doubt that the photos had a San Francisco connection. One scanned photo in this group really grabbed my attention. It was another street scene, but with a very institutional-looking building on the right. 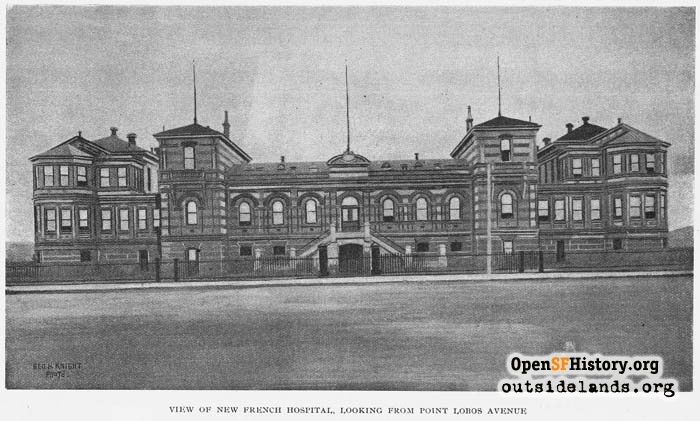 The building looked as if it might be the original French Hospital. I had a dedication brochure from the hospital’s opening in 1895 and it had a photo that matched the album photo! 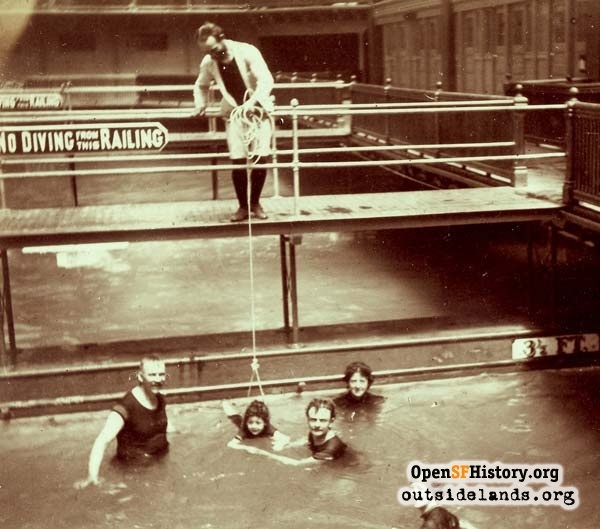 The mystery photographer had taken a picture of the hospital sometime between 1895 and 1906. After the 1906 earthquake, significant structural damage to the brick building had to be repaired, followed by some changes to the façade, including a distinctive mansard roof on the administration building. 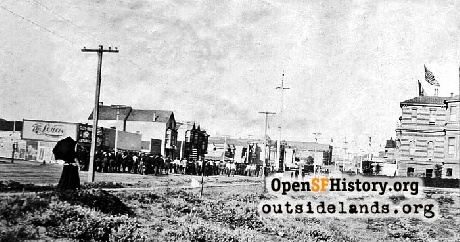 I had a location, Sixth Avenue and Point Lobos Avenue (Geary Street was not extended past Presidio Avenue until after 1909), but what was the occasion that caused all those men to congregate around, drawing the attention of the photographer? Closer examination shows an American flag draped over the façade of one of the buildings. 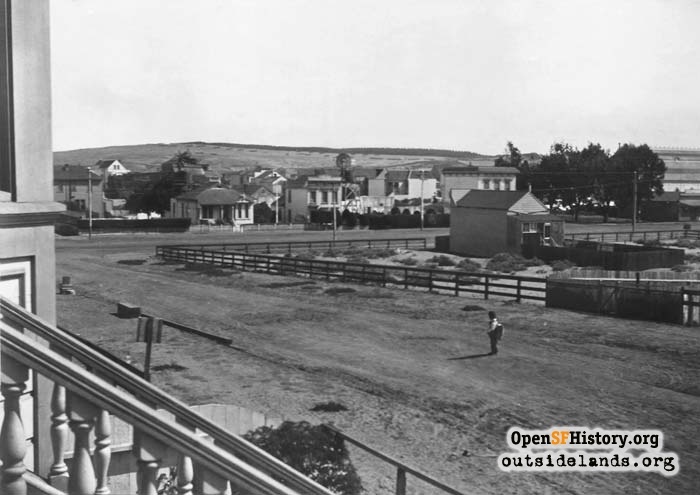 Camp Merritt, the main part of the temporary camp for army volunteers awaiting transport to the Philippines in the Spanish-American War, was from First to Fifth Avenues, Point Lobos to Fulton Street. These men in uniform were only in the Richmond District camp from May to August, 1898. The celebration must have been Fourth of July, 1898. If the photographer was taking a picture of the Independence Day celebration, he might have lived close by. I studied the view of the two houses and the intersection seen from the porch more closely. 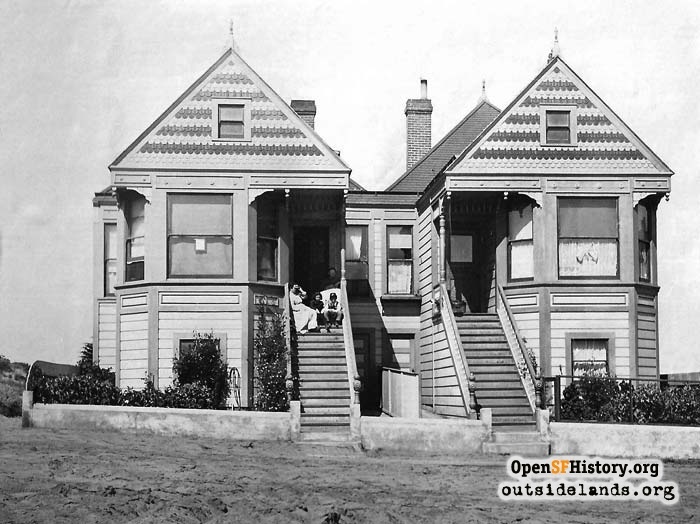 The two identical houses had no visible numbers or other clues to location, except that they were on a slight hill. The intersection, however, did yield a few clues. There were two windmills, and behind the trees on the right was a long white building with a Gothic window and a cross on the peak of the roof. 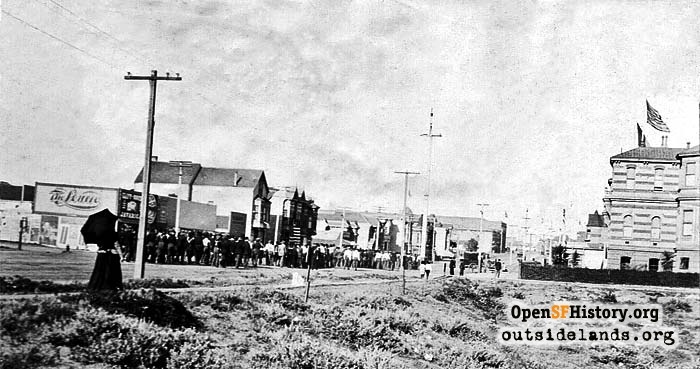 There was only one church near Point Lobos Avenue in 1898, the original Star of the Sea, which faced Eighth Avenue (right behind the nave of the current church today). I had a photo of that church in my files and brought it up. I made another match, and since the cross would have been at the rear of the church, the two identical houses would be on the south side of Point Lobos Avenue. I next turned to the 1899-1900 Sanborn Fire Insurance Map to find a footprint of two identical houses. I compared footprints on the west side of the 400 block of Tenth Avenue, since that was the only street on a grade with the south side of Point Lobos Avenue that could match the view of the south side and back of Star of the Sea Church. I found my match easily at 425 and 427 Tenth Avenue and contacted Craig to share my excitement. "Low George P., propr. and pub. 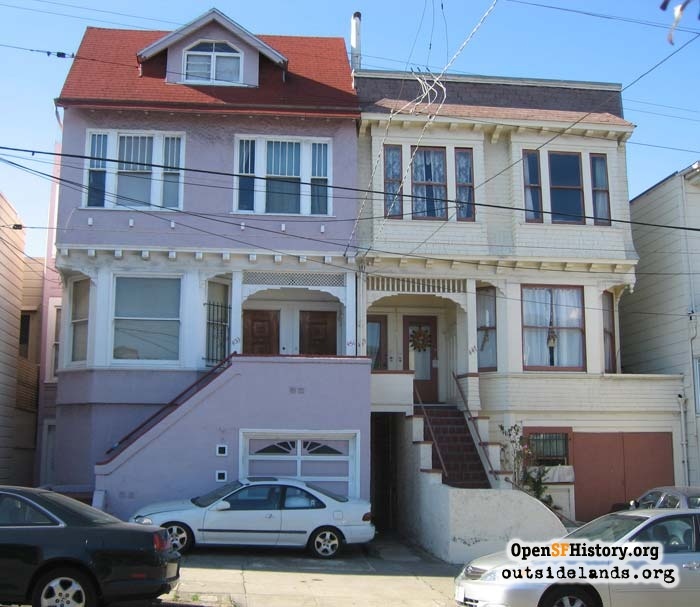 A search of an online ancestry program told us George lived at 315 Cherry Street at the time of the 1900 census, and besides his wife, he had two children, ages nine and seven, named Marian and George! These two buildings, 447-449 and 451-453 10th Avenue, had radical remodelings in the 1910s. - Photograph by John Freeman. We had found the family in the photographs; now we had to see if the houses were still on Tenth Avenue. The early years of house numbering often used one number per family dwelling, but as the outer neighborhoods expanded in the early twentieth century, the popularity of duplexes and triplexes changed the numbering system. I figured that 425 and 427 might change by the next Sanborn map in 1913, but when I searched near mid-block, I couldn’t find the characteristic footprint of the buildings found in the 1899 map. 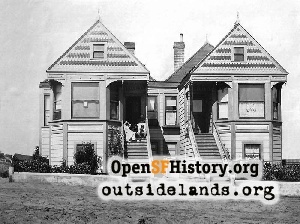 I rejected Craig’s suggestion that the 1906 earthquake could have destroyed these two substantial-looking houses, because the serious quake damage in the Richmond District had only been to brick structures or chimneys. Maybe a house fire destroyed the building? I got my next break when a friend sent me a supplementary Sanborn map of the block dated 1905 that showed the original building footprints, but with addresses of 447 and 449. With a hint of the new addresses, I did a contemporary Google street search for these addresses. There were two buildings I had looked at and rejected in my earlier search because they bore no resemblance to the peak-roofed dwellings of the 1898 photo. But with close examination, I saw what I had missed – small architectural trim features that had been retained when the buildings were converted from single-family homes to flats or duplexes nearly a century ago, in the style of the early 1910s. I found building permits showing that 447 had become 447/449 Tenth Avenue when it was remodeled in 1911 and 449 became 451/453 when it was remodeled in 1913. The remodeled building footprints did show up on the 1913 Sanborn map, but were so radically altered, I had missed them. 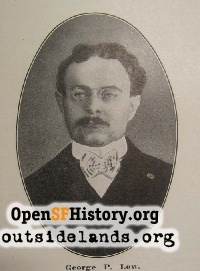 Craig and I continued pursuing George P. Low, and found that he was a respected electrical engineer who had supervised the electrical system of the Midwinter Fair in Golden Gate Park in 1894, and had signed off on the last phase of the electrical work of the City Hall in 1899. He had written briefly for the Morning Call years earlier, and in 1895 he founded the Journal of Electricity, Power and Gas, listing his office as 427 Tenth Avenue by 1897. Like so much of this story, a lot of luck went along with skill in uncovering the details. The location of the houses was moderately easy, but finding the name of the man who made the album was a bigger challenge. 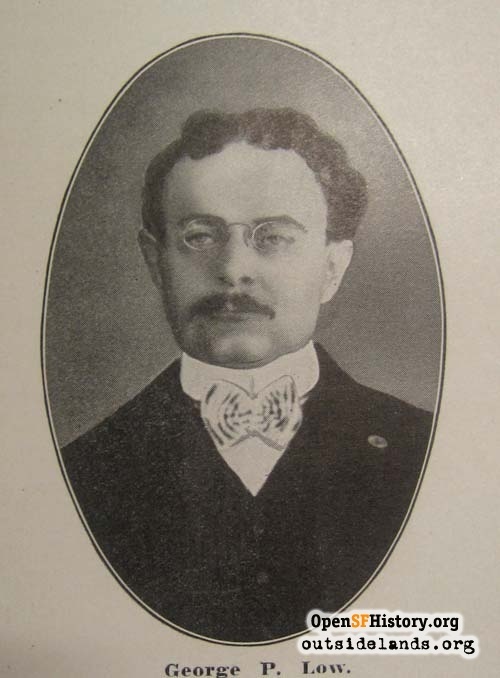 George Perley Low had only lived on Tenth Avenue for about a year and a half before moving to Cherry Street, then Mill Valley where he died in 1909. But he was a professional person whose career as an electrical engineer was noted in the press when he gave lectures or supervised building projects. 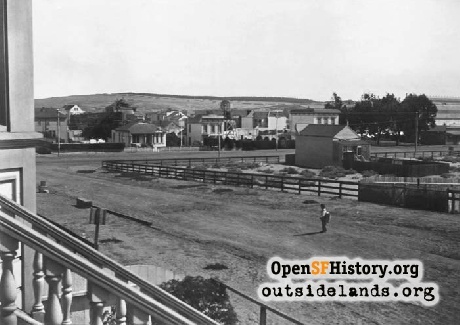 The journal he founded and edited has been digitized by the San Francisco Public Library and recently became available online. The albums were rescued by Craig Bryan just before being tossed in the dumpster. Craig became obsessed with finding out who had photographed and composed these albums, and contacted a local historical society 350 miles away, whose secretary passed the challenge on to me. Most of the albums contained baby pictures, parlor views and family outings. There was no writing except to identify the children when they were infants. Only a few of the photos had distinguishing characteristics that could be used to identify time and place, but the sum of the parts aided the search. Only a few years ago, solving this mystery would have been impossible without at least a family name, but digital technology continues to make more and more archival items not only available, but also accessible by computer without leaving home. Special thanks to the staff of the San Francisco History Center, San Francisco Public Library for help and suggestions; to researchers Peter Field and Frank Sternad for advice and research solutions; and to Craig Bryan for salvaging important photos of the Richmond District, and for collaboration and tenacity to solve the puzzle of who composed the albums and trace their journey to Los Angeles. Page launched 23 March 2012.